Jim’s 1972 appearance on Flip Wilson’s variety show was his third visit to the popular program. Along with showing off his frog population from The Frog Prince, Jim decided to highlight the talents of his performing partner Frank Oz. 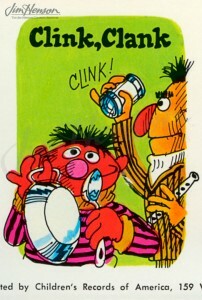 With support from Ernie (Jim), Bert (Frank) performed his joyful anthem to music made with household objects “Clink Clank.” Originally written by Joe Raposo and performed by Jim and Frank for the 1972 Sesame Street album “Havin’ Fun With Ernie and Bert,” the Flip Wilson appearance was the only time they performed the song for an audience. Learn about the Muppet appearances on Flip Wilson’s show. Here and https://www.henson.com/jimsredbook/2010/10/15/10151970-big-bird-on-flip-wilson/. 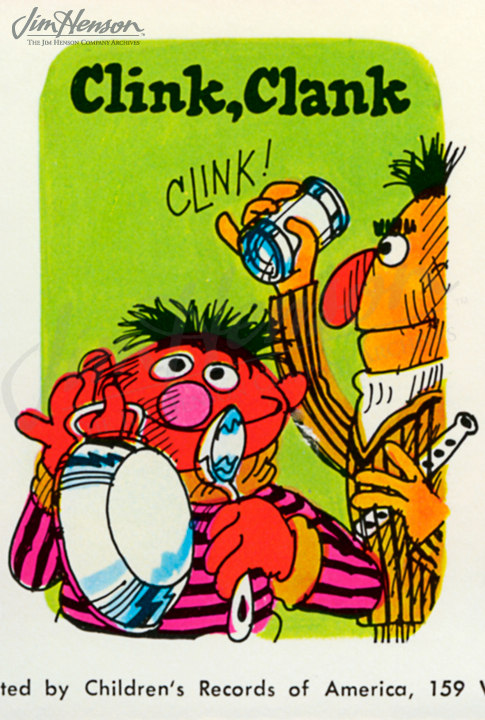 Illustration for the record album version of Ernie and Bert’s “Clink Clank,” 1972. This entry was posted in 08-August '72, 1972, Appearances and tagged Bert and Ernie, Flip Wilson, Frank Oz, Joe Raposo, Los Angeles, Sesame Street, The Flip Wilson Show, The Frog Prince. Bookmark the permalink.